Always nice to know what our (nearly) neighbours are up to. It gives us the greatest pleasure to invite you on the 2018 Lilliputters Guild Summer Tour. Note: If you only plan to attend for day trips, and do not require accommodation, you do not need to reply to this email, but we would love to hear from you, as this will help us plan for numbers attending. To reserve a place, we require you to reply to this email with your answers to the below questions. – Would you like to come for the whole week, or for part of the Tour? Note: Replies via the Facebook Group or Messenger will not be accepted. Places will be allocated on a “first come, first serve” basis. We will do our best to accommodate everybody’s requests, but places are strictly limited, so book early to avoid disappointment! We will be in touch again in a week or two to confirm your place and arrangements and next steps. Once your place is confirmed, we require a completed booking form and a £25 non-refundable deposit paid in by May 31st. These details were agreed at our meeting in Guildford, and further details (with bank details and the form) will be given in the follow-up email. If this is likely to be problematic though, please do get in touch separately! To avoid bias, and because of the number of emails expected, we will not be replying to or acknowledging booking submissions until then. We look forward to hearing from you in due course, and welcoming you on-board for the Tour. Phil Ramsbottom is a member of the St. Martin’s Guild, and an ART teacher. Move away from teaching Plain Bob Doubles which is leading to losing many recruits early in the learning process. Use other ways of teaching proper method ringing, such as Bastow, to provide a more direct and quicker route into ringing the basic lines which ringers use throughout their ringing lives. Use other techniques to teach learners (… our future ringers) and in doing so, ensure they leave the tower after every practice having achieved something and with a real sense of achievement. That way we will keep more recruits. For as many years as I can remember, Plain Bob Doubles has been the vehicle for introducing new ringers to changeringing, be it plain hunting on the treble or ringing ‘inside’. 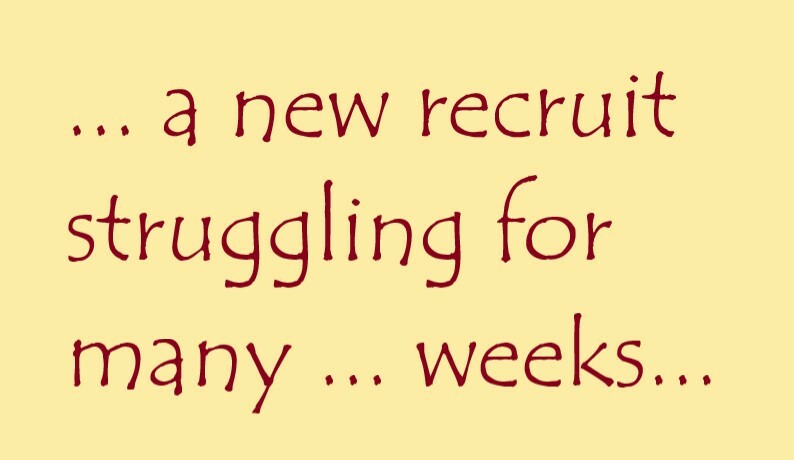 Equally, for as many years as I can remember, it’s very rarely that I’ve not witnessed a new recruit struggling for many more weeks than should be allowed trying to get to grips with the basic ideas of learning a Blue Line and converting it into actions whilst ringing a bell. after months of trying after which it seems to be another six months or more of endless 120’s keeping them as observation bell. During this stage we seem to lose far too many new recruits, which considering the hundreds of man hours invested in getting this far is an intolerable waste of teaching time. We’re teaching Bob Doubles (and very badly at that) and not teaching ropesight. 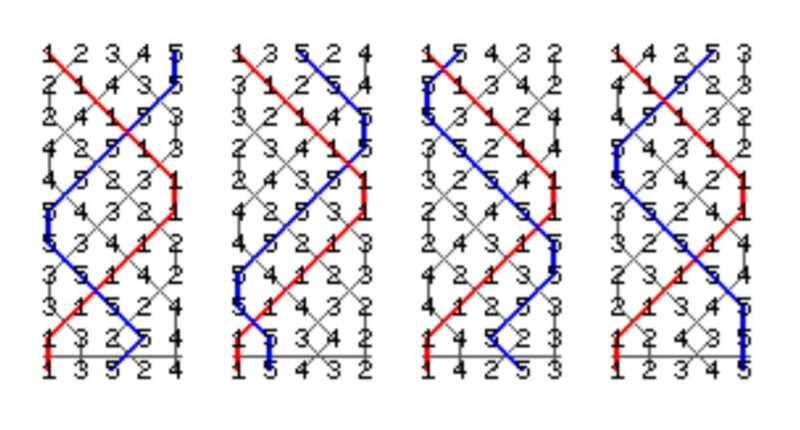 I have asked many fellow ringers why this attachment to Bob Doubles, only to be told: “Well a pupil can learn to make seconds, far places, dodge in 3-4 up and down all in the same method”. This is not a persuasive argument: a learner driver, for example, doesn’t attempt to do three point turns or hill starts in their first lesson. 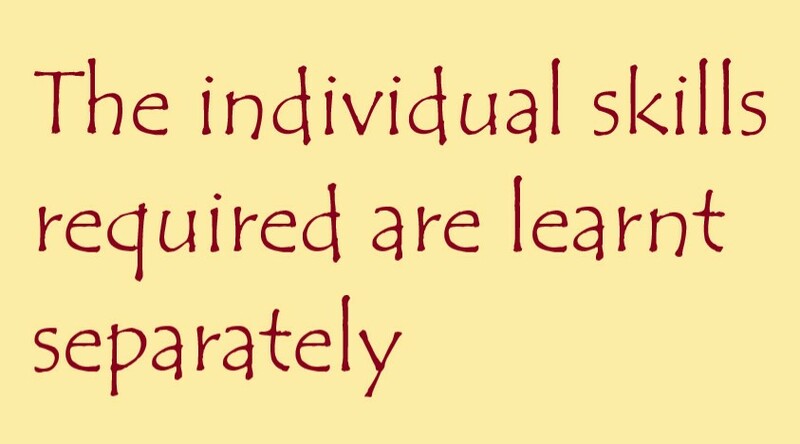 The individual skills required are learnt separately, one at a time, slowly coming together in order to gain competence. We need to introduce a system for teaching the individual basic manoeuvres used in methods and in doing so a system which will help familiarize the pupil with, and help them to develop, ropesight. Bob Doubles is not that method. It must be said that, for what follows, the use of a wipe clean board and pens in the tower will assist greatly, but only in order to illustrate the Blue Lines immediately prior to ringing without the need for weeks of revision beforehand which often ‘put off’ the learner. As I mentioned above, most learners (or least the ones I’ve witnessed) take more than a few weeks to get to grips with the mechanics of plain hunting on 5, normally memorizing the numbers, which lets face it, isn’t difficult. Only when touches are embarked on do they have their first taste of needing ropesight and thus more weeks are added to the process. So, simplify it. Begin by plain hunting on just 2 bells. For what follows, assume that 6 bells are always being rung and the pupil is on the treble. The pupil simply learns to lead for a whole turn, make seconds over the second and lead again. Just four changes but usually easily achieved after only a couple of attempts. Once competent at this, again probably after only a few minutes, then call a different bell into seconds place telling the pupil to work out which bell prior to saying ‘go’ once more. Progressively, giving less time for the pupil to find the seconds place bell (i.e. call a bell into seconds immediately followed by ‘go’). Already the pupil is grasping basic ropesight and after only say 10 or fifteen minutes at the very most. If possible, try and get this far without interruption, i.e. calling stand to ring something else. The added bonus of this is that the pupil goes home having achieved changeringing by the end of practice night, albeit very basic, unaided as opposed leaving the tower wondering: “Will I ever be able to ring Bob Doubles” which I’ve heard said many times. We then move on to plain hunting on 3 bells. Apply the same rules as above, giving plenty of practice first with bells 2 and 3 in the correct place moving on to having different bells in 2nds and 3rds place. Don’t feel the need to leave 4, 5 and 6 as cover bells, get them involved too as it all benefits the learner. Stating the blindingly obvious, now do the same again on 4 bells. Once able to do this with the bell positions changed round, there’s a several things to try next. Firstly while still ringing on 6, ring a plain course or touch of Plain Bob Minimus, with 5 and 6 covering. earlier exercises, moving on to ring touches doesn’t usually, and shouldn’t, cause too much difficulty. In all my experience of teaching, I’ve rarely had to go beyond two weeks of practices to achieve the above, although time allocation of the evening might need to be slightly more in favour of the learner, – but look at the payback! At this point, despite not having yet attempted hunting on 5, move on to ringing inside, and yes, on 4 bells not 5. Allow me now to introduce what I consider to be a rather wonderful little method called Bastow which, whilst not stretching the skills of your average ringer, is the best thing I’ve ever discovered for introducing learners to ringing methods inside and ropesight. By way of comparison I have reproduced the method here, and below, I’ve shown the more usually preferred Plain Bob Doubles. Now ask yourselves this, if you were to show the average learner these two diagrams, which of the two Blue Lines are they most likely to want to learn first? I’ve always had the same reply, – the easiest. Now call me biased, but are there any ringers out there who honestly think that the line for Plain Bob Doubles is the easier of the two? I seriously doubt it, and yet this seems to be the normal approach to teaching method ringing inside. Likewise, once a band has got this far, it’s possible to get the same band ringing courses of Bastow with only one experienced ringer. Try doing that with Bob Doubles. Ok, it’s probably been done somewhere but it’s MUCH harder work. So far, our ‘learner’ has been ringing the treble bell to all the hunting. So, lets keep life simple for them and keep them ringing the treble, – after all, they’ve got used to it by now. To do this we simply start the method in a different place, the second becomes the hunt bell (starting by leading and then making seconds etc…) and all the treble does is this^^. The purpose of this is to get our pupil to learn how to move towards a dodging position and then perform dodges in 3-4 up and 3-4 down. To begin with we can help them, for example by explaining that they won’t be dodging with the second: the first dodge is with the last bell they meet at the back; and the other dodge is with the remaining bell. Once this is mastered, and again usually quite quickly, then start changing the numbers round, and as was done in the plain hunting, introducing other bells into the changes. 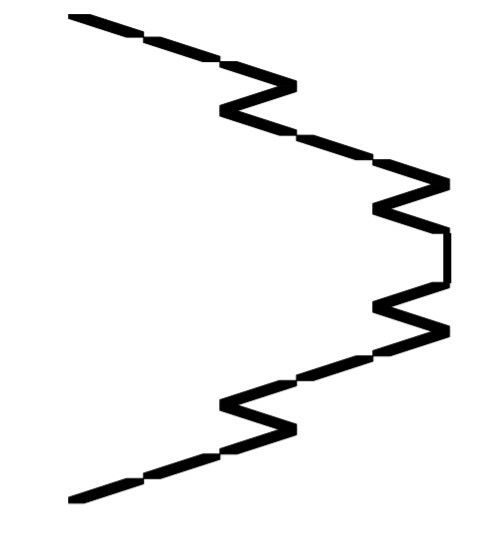 Say, for example, starting from 153246 with 4 and 6 covering. Remember, wherever possible, as with all the previous exercises, the ringing should be on 6 bells. It’s also worth noting that I don’t advocate the usual practice of learning the sequence of work, other than it’s simply 3-4 up followed by 3-4 down, another factor which makes this a more appealing way of learning method ringing. So where do we go from here? 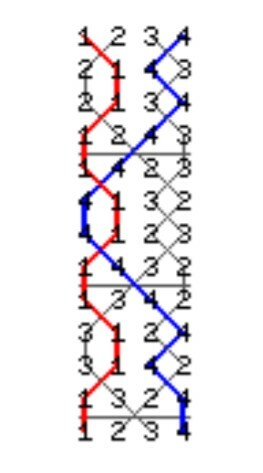 Thinking logically, and to avoid the tedium of learning the sequence of work, extend the Bastow to all 6 bells, and keeping our learner on the treble we now have a line which looks like this. 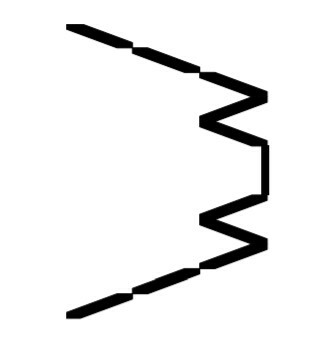 some use, say almost Treble Bob on 6, or half of Little Bob Minor. often than not learned quickly. Again, the numbers may well be learnt without trying but by this stage that’s not such a bad thing as we have a learner whom we can now move around a bit and get used to ringing different bells. For example, ringing the method correctly with the treble as the hunt bell and the learner ringing the second and/or the third. Doing this negates the need to start from anything other than rounds there being things we can now move on to which will help to develop the ropesight we’re trying to achieve. at the relevant point. That being said, there’s no reason where these two options can’t be run concurrently. Once these are out of the way there are many different paths to take. Personally I head towards learning the Bobs and then on to Plain Bob Minor and splicing it with Little Bob, even if only in plain courses at first. Stop teaching Plain Bob Doubles and wondering why we lose so many recruits at this stage in the learning process. Introduce a means of teaching proper method ringing, and by that, have a different but far more direct and quicker route into ringing the basics of the lines we ring throughout our ringing lives. Teach our learners (and our future ringers) in a way which means they leave the tower after every practice feeling as though they’ve achieved something and not just got better at something, as opposed to the usual: “Come back next week and we’ll have another go at it”. They don’t always come back next week – and it’s too late then! The March edition of “Ringing Round Devon” is available to download here. Sat April 21st, 9.30 to 2pm at Amersham, Bucks.